Noted by Domino Magazine as one of the "10 Designers to Watch", San Francisco based designer, Grant Gibson seems to be popping up everywhere these days. With his recent and notable feature in the New York Times ( and a plethora of other shelter magazines ), a thriving interior design business, a popular design blog and several San Francisco Show Houses under his belt, this designer is certainly one to watch. Refreshingly humble and generous in his attitude and approach, Gibson sits with us and discusses how it all started for him, his approach to design and clients and how he feeds the buzz. Thanks again. I enjoyed this: "...promote the business any way that I could, being there every day in the room." It's the quadruple threat of all your interviewees: Talented, personable, ambitious, grateful for the opportunities. I think you need you need you own mix of all 4 qualities. I also enjoyed: "some people don't feel confident enough to pick out their own towels ..." He's talking about me although I did pick one throw pillow that we actually use. At least I've got that going for me. Thank you so much Joni, Megan and Linda! Love the photos, absolutely love them. 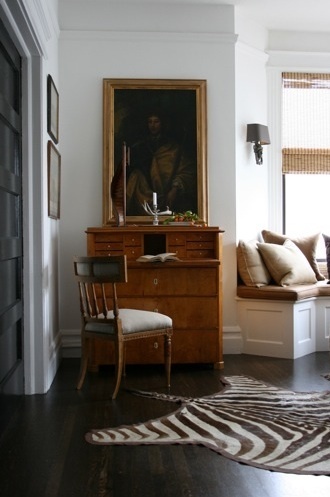 Calm, elegant sophistocation, spaces any man or woman would be comfortable in. Two months ago I went out on my own and started my interior design firm, Amy Meier Design. It was so refreshing to hear how you put that room together on a dime. Would LOVE to see pictures of your first showcase house! I am a big fan of Grant's. He is such a talent. I found his story about his first showhouse so interesting. Often the smallest spaces are my favorite-this was the case with the Georgetown showhouse this past year where a young designer created the most stunning Chinoiserie laundry room out of a miniature space. Powder rooms can be the same way-the size gives you the luxury to use over the top luxury things that would be prohibitive in a large space. An excellent interview-he is charming, engaging, and articulate and I know we will be hearing more and more about him. Thanks ladies! You did it again - you introduced me to another great, giving me a glimpse into him as a person as well as a designer. Overall, I found Grant utterly inspiring - I love that he "Took a Chance" and put himself out there at a Show House before he was an "established" designer. It just goes to show that believer in yourself (and being willing to do the work) pays off! Just the inspiration I needed on this cold, dreary January afternoon. I am so lucky to get to see Grant every once and awhile in San Francisco. He is truly talented, gracious, fun and funny. His house is as handsome in person as it is in photos. Great guy....great interview gals!!!! Love Grant even more now. Great interview ladies...you all really do bring out such a relaxed mood in these "talks". Megan, I was laughing right along with you over the whole tp topic. I too loved the little fold my cleaning lady does in my bathrooms. It's just one of those silly things that make you smile and appreciate the little gesture. I alway try to remember to do one when I do a final load in and pictures for a bathroom...although the truth is I actually stink at getting the triangle even and have to get someone elso to do it:) Anyway, it is just this sort of topic that makes blogging so fun and these interviews so enjoyable. BTW I trashed my office looking for my picture of that bathroom from the showhouse, it's one of my favorites too! Great interview! 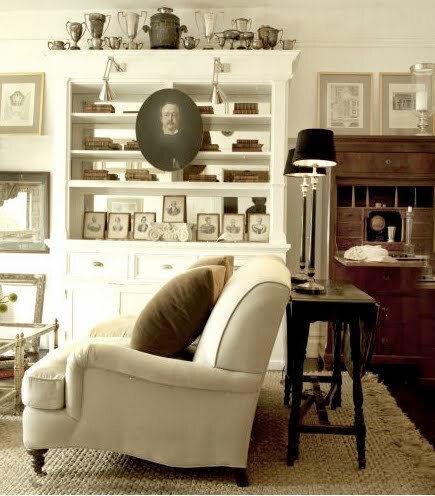 Love Grant's home...it's beautiful, yet feels so livable and not overdone or "decorated." I agree with you guys...I just know he has a very bright future ahead! Fantastic talent! Such a nice interview! GKB's work is so inspiring. I hope to see more from him soon and I wish him much success! Oh my goodness...he is wonderful! I could have listened for hours. He is charming and smart and fun. Wish you'd have him on again. His rooms are classic and now at the same time. Loved this interview ladies...great job! I am a follower of Grant's blog and I love what he does. It was so interesting to hear his voice and know more about him. Great to know how people started their business, very inspiring. Love to listen to this, a GKG fan! Thanks for the focus on this designer. So honest and refreshing to hear a designer admit their budget is not as large as their clients. I'm in the same boat, and as someone also starting out this was such a relief to hear! Great interview girls! I just wish they did showhouses here in Hong Kong! Now this is one of my favorite interviews to date. The more I listened, the more I loved him. Why oh why can't more designers be so humble. I've had two experiences with designers in this small coastal town where I currently and unfortunately reside. store (and remember, this ain't SF, or NY). I stopped in to inquire about design services and explained what I needed and that I would want to save where I could, such as, on curtain rods accessories.... The owner overheard the conversation and quipped "this isn't Pottery Barn!" I felt so embarrassed and wanted to crawl under a table- almost burst into tears- want to now as I write this. The next experience was with a local designer whose style I love. She wasn't interested in seeing magazine photos of rooms that I like (or don't like) and when I suggested, for instance, that I like tortoise shell blinds, she immediately said she doesn't like them. Sea grass sheds too much, only natural stone countertops, honed black granite looks too chalky- you name it, she didn't like any of my ideas or suggestions. Kitchen knobs chosen cost us $800.00. Seems to me there could have been a less expensive alternative, but those are the kinds of decisions I just can't seem to make on my own. I have a whole house to decorate and the bank account isn't what it was before the economy tanked. Grant gets it. He's not and I hope he never will be too hoity toity to understand that everyone needs help and things like picking paint colors are not above him. What a wonderful interview. Thanks you guys! I post regularly but, today, just in case, it will be anonymously. Anon., the costs of a plane ticket may be the best investment you can make in achieving your design goals. The worst that can happen is that Grant is busy and cannot meet you for a visit. He sounds very approachable so get your courage up and give it a try. You may be pleasantly surprised. Good Luck. We have all had those hoity toity experiences but don't let it deter you. You will have the last word. Grant speaks my language and I truly admire his design style. Timeless, classic, neoclassic. Love those adjectives! Has anyone had any luck finding the photo of the showcase work Grant did that got his foot in the door? I'd love to see it. Thanks for keeping the inspiration alive. I thought it could not get better with Judith Miller who gave us such a great education and whose book proudly sits on my library table. Grant Gibson has been one of your most interesting finds. I really enjoyed his attitude and the challenges he enjoys from clients both large and small. I hope he never loses his focus and believe with his personal touch he will be enormously successful. Compared to other designers whom you have interviewed, his attitude is head and shoulders above the rest. It was a real treat. Wish it could have lasted longer with more details of jobs he has done, their challenges and rewards. one of my favorite interviews yet!! he's so honest and down-to-earth. I thought I was the only one afraid of the heel-clicking, hug firm deisgners but you all proved me wrong. his aesthetic is insanely beautiful... i absolutely LOVE his work. was awesome to hear how he did the showhouse.. So happy for him & know he'll go far... but already has!!! Hi The Skited Roundtable Team! You guys are awesome! I love your interviews! I learn so much from them... This particular one with Grant, it was really inspiring for a young designer like me... I wish you Grant, a lot of success!!! You are daring and inspiring! Due to more then one interruption I listend to this at least two and a half times and loved it more every time! I love his approach, which reminds me of my own, especially his idea of not growing over a certain limit! I so agree with it personally! There is so much one can do for others on a smaller scale! Grant does wonderful work. I particularly love that bathroom. That bathroom is gorgeous! Would love to see more of it! Grant is utterly charming!! This is my favorite interview, not that I haven't enjoyed the others.